Christians in Egypt are mourning the death of Pope Shenouda who died last Saturday, and we join in our prayers for the Coptic Church at this sad and unsettling time. 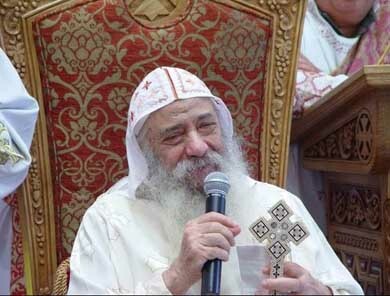 Pope Shenouda was the leader of the Coptic Church for nearly 40 years and had a huge role in shaping the church over this time. He will be greatly missed. Please pray for Egypt and the Christian community as they face many political changes in the country without their familiar leader. Our news this week is that our retreat to Anafora has fallen through. This was not due to the political situation in Egypt, but rather the usual confusion and misunderstandings which can occur here. We hope to rearrange the trip later in the Spring. We, of course, are still searching for a pastor to minister here at St. Andrew’s, and the Pastoral Search Committee sent out letters, pastoral and congregational profiles and other documents to a number of organisations this week. They should be available for downloading from our website soon. 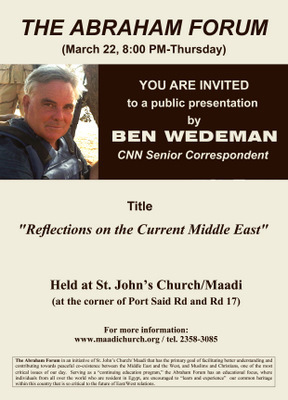 Those living in Cairo may be interested in a talk at St. John’s, Maadi, this Thursday night by Ben Wedeman, CNN Senior Correspondent, entitled “Reflections on the Current Middle East”. It begins at 8 p.m. More details below. Living in Egypt is never dull, things are ever changing and seldom as they seem. It is even more important to trust in God in these uncertain days, but that is also part of what makes the Christian faith exciting. Unfortunately, Anafora is no longer able to host us at Easter. We hope to rearrange the retreat later in the year. We will have another skype prayer meeting on Tuesday at 7pm. Add “iainbaxter” as a skype contact to join in.